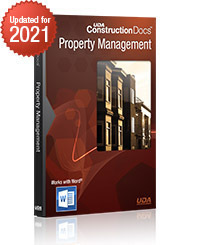 Manage your rental properties efficiently with a complete library of Lease Agreements, Terms and Conditions, Applications, Notices, Property Management Forms, and Detailed Checklists. Documents can be modified to fit your project needs and are provided as word processing files for Microsoft Word, Works, WordPerfect and most other word processing applications. Property Management is part of the UDA ConstructionSuite family of products, and also available in ConstructionSuite Corporate and above. Special Offer - Instant Savings. which combines all six available UDA contract packages. Learn more.